Transmanche Ferries ticket reservations, ferry timetables and passenger information for Transmanche Ferries sailing to and from Newhaven, the UK port closest to London and Dieppe in France. Booking Transmanche Ferries tickets has never been easier, compare all Transmanche Ferries prices in real time and book the cheapest available Transmanche Ferries tickets to and from Newhaven, the UK port closest to London and Dieppe in France online with instant confirmation. Travelling by Transmanche Ferries is a quick, easy and stress free way to get there and back again. Book you Transmanche Ferries car or passenger ferries tickets with us and enjoy more choice and flexibility. With the latest Transmanche Ferries crossing information and timetables for all ferries sailing to and from Newhaven, the UK port closest to London and Dieppe in France including information on the ferry ports and useful tourist information about the destinations our detailed route and city maps will help you plot your Transmanche Ferries ferry journey. If are travelling by car, with your family or as a solo foot passenger book a ferry crossing with Transmanche Ferries and arrive at your destination refreshed, relaxed and happy. Transmanche Ferries offers fantastic fares to and from Newhaven, the UK port closest to London and Dieppe in France ferry ports. Book Transmanche Ferries tickets to and from Newhaven, the UK port closest to London and Dieppe in France online in advance at Ferryto.co.uk and you will always enjoy our cheapest available ferry ticket price. The price you see is the price you pay. There are no hidden extras or surprises such as added fuel surcharges or booking fees and we do not charge you anything extra for paying with a Visa Electron card. The price we quote you for your selected Transmanche Ferries route, onboard accommodation and vehicle type is all you will pay, and that's a promise. To obtain a Transmanche Ferries ticket price and book your ferry ticket securely online please use the real time ferries booking form on the left. Transmanche Ferries operate a ferry service between Newhaven and Dieppe in France, up to 3 times daily. In just four hours, Transmanche Ferries takes you from Newhaven, the UK port closest to London and a short distance from the famous seaside resort of Brighton, to Dieppe, ideally situated in Upper Normandy with fast connections to Paris and all parts of Northern France. Transmanche Ferries all year ferry service between Newhaven and Dieppe operates with two very comfortable and modern vessels, the Seven Sisters and the Côte d’Albâtre. It was formed after the previous operator of this route, P&O Stena Line, decided to concentrate on that company's primary route of Dover - Calais. The last P&O Stena vessel on the route, the Stena Cambria, undertook her last sailing on 31 January 1998. No vessel replaced the Stena Cambria service until a high speed passenger service was instituted by Hoverspeed using SuperSeaCat Two in April 1999, however this service ended in 2004. Despite the Hoverspeed passenger service, a conventional passenger-vehicle freight service was desired for the Dieppe - Newhaven route. Transmanche Ferries is part of the LD Lines passenger and freight ferry ship network and operate a ferry service between Newhaven and Dieppe in France, up to 3 times daily. In just four hours, Transmanche Ferries takes you from Newhaven, the UK port closest to London and a short distance from the famous seaside resort of Brighton, to Dieppe, ideally situated in Upper Normandy with fast connections to Paris and all parts of Northern France. Transmanche Ferries offer crossings between Newhaven and Dieppe connecting the closest ports to London and Paris.The two ships Seven Sisters and Côte d’Albâtre serve the route from Newhaven to Dieppe. These are the two modern and comfortable ships providing passengers with various facilities onboard .Transmanche Ferries operate up to three crossings per day both ways with an approximate crossing time of about 4 hours, thereby offering our customers more flexibility and choice of sailings. Newhaven / LeHavre crossings are operated by LD Lines, the sister company of Transmanche Ferries as a summer only route. LD Lines are offering this route to provide more choice and convenience to the customers in the summer months. Transmanche Ferries vessel, The Seven Sisters has been chartered to operate the ferry route from Newhaven to LeHavre once every day from May to September each year. LD Lines, the sister company of Transmanche Ferries offer crossings from Portsmouth to LeHavre onboard two of their most modern and comfortable ships the Norman Spirit and the Norman Voyager. LD Lines operate at least one crossing every day all year round often as an overnight crossing from Portsmouth to LeHavre and as an evening crossing from LeHavre to Portsmouth. From November 2008, an additional crossing is being offered on both ways. LD Lines, the sister company of Transmanche Ferries have recently announced their new route between Ireland and France. The new service will begin in November 2008, connecting the port of Rosslare in Ireland with the port of LeHavre in France at economical prices. This service is offered on board their newest ship, the Norman Voyager which is an ultra modern cruise ship. Launched in 2006, the Seven Sisters is a superb new ship, capable of speeds of up to 22 knots (more than 40 km/h).It is equipped with ultra-modern stabilizers and therefore offers optimum comfort whatever the sailing conditions. You’ll appreciate the many leisure areas – including a magnificent panoramic lounge – the elegant surroundings, the bar, restaurant, boutique and children’s play-areas. Launched in 2006, the Côte d’Albâtre is a superb new ship, capable of speeds of up to 22 knots (more than 40 km/h). It is equipped with ultra-modern stabilizers and therefore offers optimum comfort whatever the sailing conditions. Relax, enjoy yourself, for a few hours, you’re on a cruise. The Norman Spirit is a rapid, up-to-date ferry fitted with stabilizers providing optimal comfort. You’ll find restaurants, cafeterias and a pub.There’s comfortable seating and a friendly and refined atmosphere in the lounges, a kids’ area, Internet access, private cabins and shopping. With a real quality of service, the pleasure begins from the moment you board the ship. Speed and comfort are guaranteed on board the Sorrento car ferry which. The Sorrento has a wide range of amenities: a self-service restaurant, a lounge bar, a cinema, a shop, a games room and a sun deck bar. 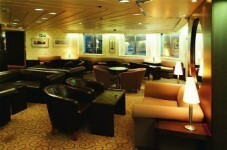 Accommodation includes 62 reclining chairs and 93 inside or window cabins all with toilet, shower and air-con. Best Price Guarantee - We always offer you our lowest available Transmanche Ferries ticket price and there are no hidden extras or surprises such as added fuel surcharges or booking fees and we also we do not charge you anything extra for paying for your ferry ticket with a Visa Electron card. The price we quote for your selected Transmanche Ferries car or passenger ferry ticket, onboard accommodation and vehicle type is all you will pay for your ferry ticket, and that's a promise! In the unlikely event you find the same all inclusive Transmanche Ferries ticket cheaper in the brochure of any other tour operator we promise that we will do our best to beat that price or offer you the choice of requesting a refund. To book Transmanche Ferries tickets please click here. Discounted Group Travel with Transmanche Ferries - Ferryto.co.uk offer a dedicated personal and affordable Transmanche Ferries group and coach party ferry passenger reservation service offering you the lowest available ferry rates. Our specialist Transmanche Ferries group travel team will secure the best deal for you and your passengers. The only requirement to qualify for discounted group travel ferry rates is that your party should be at least ten people and travel at the same time. For more information about group travel on Transmanche Ferries please click here. Ferry Logistics offer a personal and affordable Transmanche Ferries freight and cargo ferries reservation service to and from Newhaven, the UK port closest to London and Dieppe in France. In addition to offering preferential rates to commercial operators and haulers Ferry Logistics is now also able to offer discounted ferry freight rates to private customers such as those wanting to take transit vans on any of the Transmanche Ferries routes serviced. For more information and an instant online quote for your commercial vehicle ferry crossing please click here. At ferryto.co.uk you are able to obtain live Transmanche Ferries ticket prices, check availability, view ferries timetables and book Transmanche Ferries car and passenger ferry tickets at our lowest available ticket price. Ferryto.co.uk is part of the world's largest online ferry ticket distribution network providing the ability to book over 80 major European ferry operators including with Transmanche Ferries to over 1,200 ferry routes throughout the UK, France, Spain, Ireland, Holland, Eastern Europe, the Mediterranean, the Baltic and North Africa. Choose Transmanche Ferries ferries for the cheapest ferry ticket prices to and from Newhaven, the UK port closest to London and Dieppe in France.